It is largely agreed that the semantic enrichment of resources provides for more information that can be used for search (see e.g. (Heflin & Hendler, 2000) or (Spärck Jones, 2004)). In turn, this can lead to greatly improved effectiveness of retrieval systems, not only for resources on the web but also for personal desktops. However, critics (McCool, 2005) as well as advocates (Sabou, d’Aquin, & Motta, 2006) of the Semantic Web agree that only a small fraction of resources on the current web are enriched with semantic information. The sparse annotation of resources with semantic information presents a major obstacle in realizing search applications for the Semantic Web that operate on semantically enriched resources. To overcome this problem, we propose the use of techniques from soft computing in order to find relevant resources, even if no semantic information is provided for those resources. The main idea of our approach is to perform associative search using spreading activation in a two layer network structure (graphically illustrated in Figure 1) which consists of (1) a layer of concepts, used to semantically annotate a pool of resources, and (2) a layer of resources (documents). The combination of spreading activation in both layers, traditionally performed either to find similar concepts or to find similar text, allows a search to be extended to a wider network of concepts and resources, which can lead to the retrieval of relevant resources with no annotation. In this chapter we describe our approach towards information retrieval in the Semantic Web and present a retrieval service. The rest of this chapter is organized as follows: in section Terminology and Related Work we introduce the main concepts of Associative Information Retrieval, Associative Networks and Spreading Activation that underlie our approach to retrieval and examine related work. In section An Associative Information Retrieval Model for the Semantic Web, we describe the retrieval model, which was developed based on techniques from soft computing. In section Application of the Retrieval Model within APOSDLE we present the setting in which a retrieval service based on our retrieval model was realized. In section Parametrization of the Retrieval Model we describe which measures where used to parameterize the retrieval model. In section Evaluation we focus on the evaluation of the retrieval service. In section Parameter Learning using Relevance Feedback we present work on adapting the network structure based on relevance feedback by the user. We end the chapter with Conclusions and Future Work. This invited book chapter contains work already published in (Scheir et al. 2008). In section Parameter Learning using Relevance Feedback we present recent – not yet published - research. Certainly this new aspects need to be better integrated in future versions of the retrieval model. 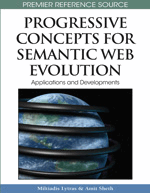 The work presented in this chapter provides a retrieval model for the Semantic Web and an implementation of an associative retrieval service based on this model. In this section we briefly introduce the important terms underlying our work: Associative Information Retrieval, Associative Networks and Spreading Activation. Furthermore we briefly discuss other approaches to information retrieval in the Semantic Web and systems. In particular we review the efforts that have used the same or similar soft computing techniques.